Holy Smokes it’s been a while since I’ve blogged! I feel bad for those who have been checking back here for updates, and promise from here on in there will be regular updates. And here goes my pledge to you: Once I land in London, I hereby pledge that I will post DAILY blog updates. But I warn you….depending on how chaotic the day is the update may just be a few brief words and some pictures. So since my last update in March, it’s been a whirlwind of activity. Preparing, Preparing and more preparing! All of the support team have been incredibly busy doing our best to have everything in place, working through the list of outstanding items, and generally doing what we can so that the arrival & stay for our human and equine athletes, grooms, team vets, team farriers, and owners go as smoothly as possible. We had an amazing & very public team announcement at Spruce Meadows on July 5. It was standing room only for the press conference, and although our Eventing and Dressage Team members were unable to attend I am hugely encouraged by the vast amount of press the event generated for Equestrian. A massive thank you to Equine Canada’s Cheryl Tataryn & Karen Hendry-Ouellette for all of their monumental organizing efforts, to the Canadian Olympic Committee who worked in partnership with Equine Canada, and to Spruce Meadows for their incredible generosity in hosting the press conference at their facilities. When I get a chance, I will post links to the various news articles and videos. This press conference to do the official “unveiling of the team” is the first time we’ve ever done such an event, and I’m so encouraged at how successful it has been as it will mean we can plan for bigger & better announcements for future Games and hopefully have team members from all of our Disciplines able to take part in person. Our Dressage team have been in England since mid-June. They enjoyed a great warm-up show at the Hartpury CDI3* (results here) and are now settled into their training camp location. Chef d’equipe Gina Smith and Team Manager Christine Peters leave tomorrow to join them. You can find some great pictures that Jacqueline Brooks and Diane Creech have been uploading to their Facebook pages. Aside from the soggy weather, looks like everyone has settled in splendidly and are enjoying being able to focus on themselves and their equine partners in the leadup to the Games. Our Eventing team arrived to their training camp just a few days ago, and by all accounts they are doing brilliantly. Sadly their warm-up show (Gatcombe) was cancelled due to the incredibly heavy rains England has been experiencing these past couple of months. But Plan B is already in the works. They have also been great about posting pictures and updates so check out Phoenix Equestrian Team (Jessica Phoenix & groom Amanda Jones) and Pamela Nunn (groom extraordinaire for Shandiss Wewiora) on Facebook, and Hawley Bennett-Awad on Twitter. Our Jumping team aren’t scheduled to arrive until July 23rd. I recently read a fantastic interview on our totally amazing Chef de Mission Mark Tewksbury, where he talks about what kind of medal performance Canadians can expect this summer. I know that is the question on most people’s minds, and certainly the #1 question the media always like to ask. I absolutely love Mark’s response because it is so true. The depth of competitiveness at an Olympic Games is always incredibly intense. While winning a World Championship or World Cup is nothing to sneeze at, there is sometime extra special & magical about an Olympic medal and forever being referred to as an “Olympian”. Every single athlete who will be competing in London will be giving their everything, laying it all out on the competition field so that when they walk away they know there was nothing more they could have given. Medals will be the difference between fractions of a second or point. Medals will be lost by the mere bat of an eyelash, slight miss-step, or millisecond of a hesitation. Imagine that being your work environment! We will have quite a large Canadian Equestrian Team contingent in Greenwich – 72 people + 14 horses. And that is not even counting family & friends who will be making the trip over the pond to wave the maple leaf from the spectator stands. 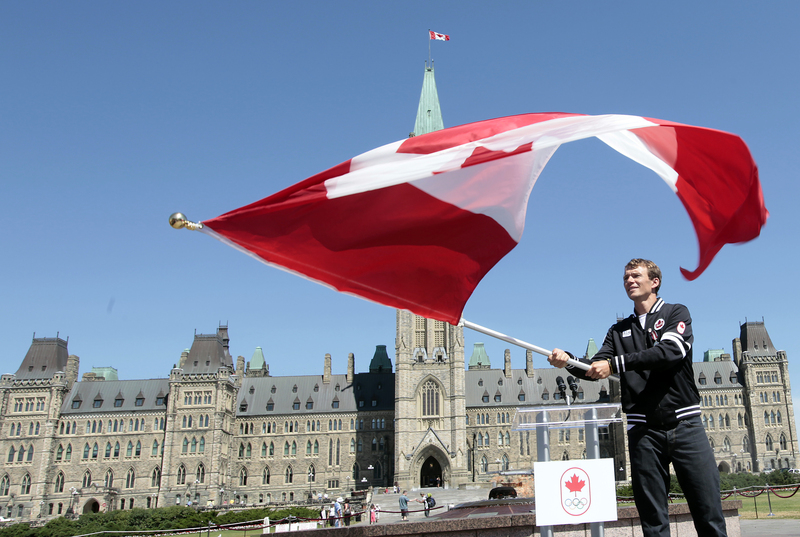 Today the Canadian Olympic Committee announced our flagbearer. Although I’m disappointed that Ian Millar didn’t get the nod, I am really thrilled that it is triathlete multi-Olympic medalist Simon Whitfield. I’ve been a fan of his since I saw him run across the finish line in Sydney to grab the Gold medal, and follow his blog & Twitter. He is the ultimate example of Canadian pride and sportsmanship – a true role model who will lead our athletes with great style into the Olympic Stadium July 27th. Congrats Simon! Ok – that’s it for me. It’s almost 11:30pm and I still have work to do. Members of our Canadian Eventing Team! Hi Kerri, All the best in London. I will be watching daily on my multiple screens. Please let the team know I will be cheering. GO Canad GO! Good luck to you and Tina; I know you will both continue to make us proud. Equestrians in Canada will be looking wistfully across the oceans towards London, and reading your blog voraciously! Thanks for doing this, Kerri and for all your hard work. The behind the scenes preparation must be monumental; I think you deserve a medal for it. Have been looking forward to this blog and you never disappointment me. You seem to cover everything we “Olympic groupies” want to hear and see!! Best wishes to you, Tina, all the other volunteers and of course the Canadian competitors. I am proud to share this Canadian moment with everyone.